You are a few clicks away from learning and fun. Follow the three simple steps below. Instructions are for Internet Explorer 7. Other browsers or versions of IE are very similar in download function. Step 1 -Click the download link for the demo or the full version (in web page and e-mail after purchase) then click "Save" on the panel that appears. Step 2 -The below panel will appear. Click "Save" again. Step 3 - Once finished downloading, the last panel will appear. Click "Run" ("Open File" in Firefox) Then, just follow the directions for the install. The file will be copied from our server to your computer. The security warning is always on this panel for any IE download. 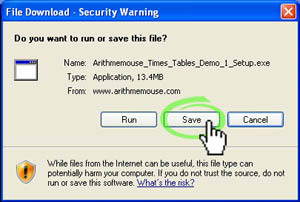 Arithmemouse Times Tables is free of spyware/adware/malware. We dislike this sort of thing as much as you do. Also, Arithmemouse Times Tables has no code to utilize the internet in any way, and has been approved for download by download sites that have rigorous standards. Select a download location. (Defaults to desktop.) The setup file is like a tightly packed box (small file size for quicker download) with art and code in it. When you install it in the next step, the box is opened and all the art and code goes in its proper place unpacked. The setup file on your desktop can be deleted after step 3 unless you want to keep it for install on another machine. 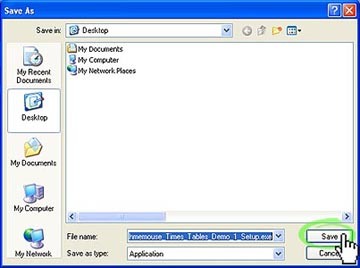 To do this, you can transfer the setup file to a usb thumb flash drive and then to another computer. It's easy. When you "Run" a program, you are activating it. In this case you are running the setup program that you just downloaded. Check the empty box for desktop icon option for an easy startup later, or use the Start >All Programs>Arithmemouse Times Tables Demo path to start Arithmemouse Times Tables. Wasn't too hard, was it? 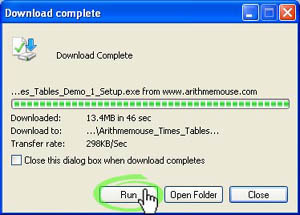 If the download file has finished, but you do not see an option to "Run" or "Open File", you can still install the file. Most browsers will download by default to the desktop (the screen you see on startup), so find the file there and click on it to activate it. The demo file is named "Arithmemouse_Times_Tables_Demo_1_Setup.exe" (If you don't see the setup file on the desktop, for the full or the home versions you can search for the word "arithmemouse." Just follow the onscreen install directions that appear after clicking on the "Arithmemouse_Times_Tables_Demo_1_Setup.exe" file. Again, it's very easy. Once you learn how to download/install software, you can download and install many other useful programs. You can do it. Please note that the key to using this game properly is to play levels that challenge the player over and over again. There are 10 questions per run with a simple encouraging grading system provided on the last teleporter in each level. Questions are random, so it is never the same course twice. Controls: Esc key (upper left hand corner of keyboard) is used to close and access menu. Arrow Keys: Move left or right. Space Key: Fire blaster (to destroy old debris obstacles). Please note that the key to using this game properly is to play a few times the appropriate level the night before a timed test. Controls: Tilt the device left or right to move left or right. Screen Tap : Tap anywhwere on the screen to fire your blaster (to destroy old debris obstacles). In Arithmemouse, the player is represented by "Arithmemouse," a robot mouse who learns his times tables facts in virtual environments. Play is intuitive in Arithmemouse Times Tables. Little robots called "tip mice" aid and encourage the player throughout the game. Arithmemouse uses simple controls-- the arrow keys to move and the space bar to jump. Arcade skills required are minimal with practice jumping steps in the first world prompted by a tip mouse. Arrows pointing the right way to go are on many walls. The player starts at Times Academy and must enter the door for the multiplication facts to be practiced (selecting 0-12). Please note, that though there are no levels for 0s and 1s, tip mice give advice to the player on the rules for multiplying by 0 and 1. Moreover, the player will get 0s and 1s times questions in each of the other 11 levels 2-12. After entering a door in the Times Academy level, the player must then move through an available teleporter to advance to the selected level. Once in the selected level the player will start at the review steps and must use the arrow keys to move and space bar to jump advancing to the top of the review steps. The player will then go through the door labeled "ENTER" to advance to the first times challenge room. A times challenge room represents a single times question. The player's goal is to use the correct number box for the given question to exit each times challenge room. Correct number boxes are used as platforms, teleporters and triggers to gain access to the times challenge room's exit. In order to advance through an entire level, each of the level's 13 questions (0-12 ) (13 times challenge rooms) must be answered. If the player fails to select the correct answer box, the player will fall or be teleported to the review room and be given the correct answer. The player can then advance through a teleporter to try the same question again. The player can only advance to the next times challenge room by selecting the correct answer box. After successfully selecting the correct answer box, but before entering the next times challenge room, the player will enter a review hall (different than the review room mentioned previously) which serves to re-enforce the right answer in the player's mind. If a player gets lost, the player can just follow the arrows to advance in the right direction. Some of the obstacles are somewhat puzzle-like which further encourages thinking. Arithmemouse is about learning; absent from Arithmemouse are life meters, violence, and punishments for failure. MAC users please note: You can try Times Tables Warp for Mac instead of Arithmemouse TImes Tables, but if you want to run Arithmemouse Times Tables on a Mac, read the following: Though Arithmemouse Times Tables was designed for Windows, there is a way to make it work on a Mac using the Mac/Apple application called Boot Camp. Once you get Boot Camp set up, in addition to Arithmemouse Times Tables, you can run almost any Windows application on your Mac machine. Boot Camp is a utility built into Apple's Mac OX v10.5 "Leopard" and 10.6 "Snow Leopard" operating systems. Macs released after October, 2007 will have the Boot Camp utility built in. Boot Camp requires an Intel-based Macintosh computer and at minimum a valid copy of Windows XP Home Sp2. Copies of Windows XP Home can be found for about $90 at places like tigerdirect.com. In a nutshell: You use the Boot Camp feature built in to OS X 1.5 or better to set aside hard drive space for an install of Windows. You can then boot to either Mac OS X or Windows on startup by holding down the option key. When in Windows mode, your Mac runs Windows apps just as fast as any PC with similar hardware. Currently, computers with integrated 3D graphics ability account for most PC shipments which means that there is no need for a special video card on a recently purchased machine. Also, almost all current notebooks and netbooks will have an integrated 3D chip and so can easily run the game. 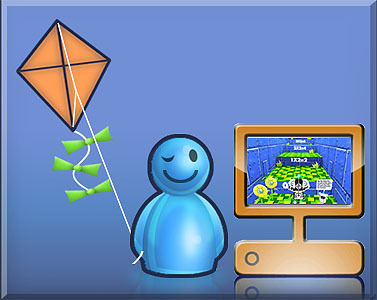 Windows machines older than 2000 or machines without an integrated 3D chip can often run 3D games well with an updated graphics card and updated Direct X drivers. Older graphic cards (i.e. Geforce 5200, Geforce 6200 or Geforce 6600) with 3D acceleration can be found on ebay for $15-$50. (It's a good investment as it will open up a world of software that would otherwise not run on an older machine.) Changing a graphics card can be done in 15 minutes or so with a phillips head screw driver following the directions provided by the manufacturer. Most older computers will accept either PCI (not "PCI Express") video cards or AGP cards. Another budget option, is to give up on that old WIndows 98 or 2000 machine, and purchase a netbook or desktop machine with integrated graphics chip. For desktops, the Dell Optiplex 280 can be found for about $60-$160 on ebay running Windows Xp. Netbooks are a great value and can be found new for about $300+ running WIndows Xp and above. The best thing to do is first try the demo to see how well the game runs on your machine. Cannot run on a Mac without OS Xv.1.5 using Boot Camp and a Windows install. (Many Macs can run Windows and a Mac OS) It's the best of both worlds in one machine. Keeping your graphic card drivers up to date is always a good idea. How do you pronounce Arithmemouse? "A-Rith-Muh-Mouse" It's like Arithmetic only with a "mouse" instead of a "tic." Not without using Apple's free Bootcamp feature which requires a copy of Windows XP Sp2 or better. See previous text on this page about Bootcamp for details. Is Arithmemouse a mouse or a robot? He is an advanced robot who is not programmed or hard wired to process data like traditional computers, so he must learn and adapt. This feature makes him and robots like him less suited for immediate tasks but very adaptable to whatever it is they want or need to learn (just like humans). His real name is Cosmo Cheddar. He loves Mathematics so much that everyone has always called him Arithmemouse. That is, "Arithmemouse" is really only his nickname. So the tip mice and Arithmemouse are both..."mouse robots"? Yes. The tip mice are wise elder mice there to aid Arithmemouse. Artist and coder Galen Tingle with help/encouragement from family and friends created Arithmemouse Times Tables. See "About" link at bottom of page. "Of all the math games, of all the multiplication games, I love Arithmemouse Times Tables the most! Arithmemouse Times Tables is a great multiplication game! Will there be other Arithmemouse games?" Can I send you my ideas to improve the game? We also like it when folks write to tell us that they simply like the game as it is. It really does make our day and inspires us.